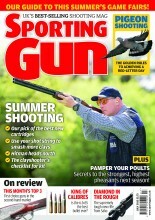 How can I get more shots when pigeon shooting? Fields next to roosting woods, often disappoint, for the very reasons you describe. My own little wood of 15 acres often holds large numbers of pigeons, but I can count on the fingers of one hand, the times I have had a decent shoot on any of the fields nearby. However there are a couple of things you could try which have worked for me from time to time. On the day you intend to shoot, walk any roosting pigeons right out of the wood without firing any shots at them, with any luck, if they are keen on your field, they will not completely vacate the area. The other alternative is to clear the wood the night before, and then set up at dawn to ambush the pigeons as they return to the wood. Be prepared for them not to decoy very well, as they will almost certainly head for the trees first.